Ever thought about streamlining your business workflow with a document management solution? With today’s fast paced working environment it is crucial that businesses are able to distribute electronic documents anytime and from anywhere. 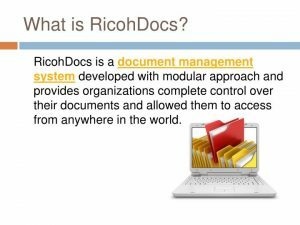 With RICOH Content Manager Software (DMS) you have access to a centralized document management repository makes information easy to find and allows multiple users to review and edit documents in real time across different devices. With a fixed monthly subscription fee you pay for what you get and can easily expand your package as your company grows. This allows you to budget each month without getting a surprise bill at the end. Not only do you have the capability to securely upload and store documents, you can categorize documents by type and manage them throughout their life-cycle, collaborate with individuals and departments, easily search and locate the correct file, access a full audit trail of all activity and much more. Businesses who subscribe to RICOH Content Manager have the choice of different user, storage and term length accounts to suit their business requirements. As needs grow, you can add users and/or storage to their subscription.